In the last 2 decades computer tower design, dimensions, and placement, have changed dramatically from the days of the old plain beige desktop tower positioned under a 25lb CRT monitor. Today mainstream big brands such as Dell and HP have done little to the tower design except ensure brand awareness amongst perspective customers. I believe many are guilty of computer case complacency. Many are so focused on the latest processor or speediest hard drive and fail to give a second thought to the computer tower choice. 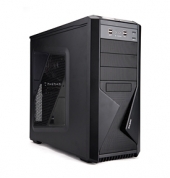 Thankfully many after-market companies produce well designed and alluring cases to house your new PC investment. ZALMAN continues to ensure computer case options are available for enthusiasts and general users with a range of PC towers. Let me present the ZALMAN Z9 mid-tower computer case, an excellent choice for housing that new gaming rig or for those general PC users wishing to ‘think outside the cube’ when it comes to the shell of the computer. Join us as we check out the latest computer case offering from ZALMAN.